Havana Humidors bring back memories of old Havana, Cuba. The stylish and authentic Birdseye maple burl exterior and maple trim on the top features a High Gloss Piano finish that is the result of an astounding 12 coats of lacquer. With a capacity of 150 cigars, the custom HAVANA humidor includes a Virgin Spanish cedar interior, which helps retain humidity, while preserving the cigars and enhancing their aroma and taste. 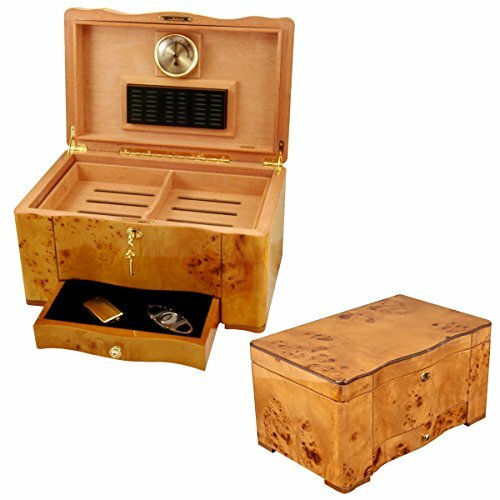 These elegant humidors also boast a felt lined accessory drawer, Virgin Spanish cedar aerator tray and removable dividers, gold plated hidden quadrant piano hinges, gold plated lock and key, a hygrometer, a humidification system, and much more. This custom Cuban cigar humidor is one of the best humidor bargains anywhere and perfect for the true cigar aficionado. The Outside Dimensions are 15 1/8 x 9 1/2 x 7 7/8. These are the original HAVANA Humidors and unlike many imitations, have a true capacity of 120 Cigars. The stylish and authentic Birdseye maple burl exterior and maple trim on the top features a High Gloss Piano finish that is the result of an astounding 12 coats of lacquer. Elegant cigar humidor that holds up to 120 cigars. The Outside Dimensions are 15 1/8"x 9 1/2" x 7 7/8.